Bartholomew Deep is a section of the submarine Peru Chile Trench (also known as the Atacama Trench) lying some 80 kilometers (50 miles) off the coast from Antofagasta, Chile. It lies on the Tropic of Capricorn. At its deepest point it is some 7,154 meters (23,471 feet) below sea level. John George Bartholomew worked with Sir John Murray on mapping the findings of the H.M.S. Challenger Expedition (1873-76). John Murray named this trench it after his friend John George. 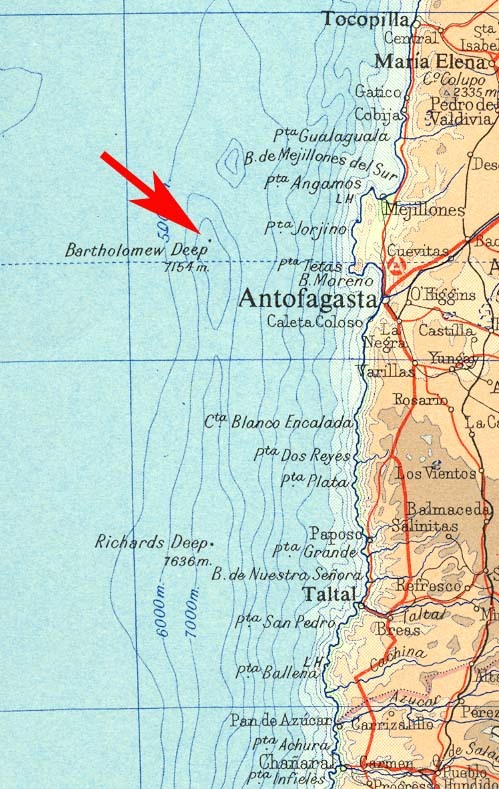 Bartholomew Deep extends some 400 kilometers to the South to a point off Caldera, Chile. The Times Atlas (see below) suggests it to be less extensive. 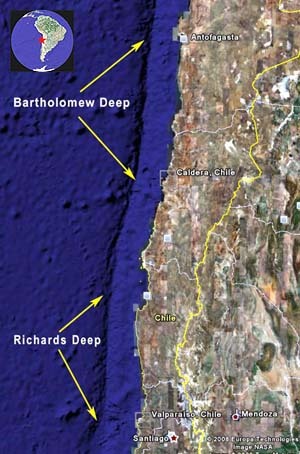 To the south of Bartholomew Deep is Richards Deep, which is the deepest part of the 5,900 kilometer-long Peru Chile Trench at 8,065 meters below sea level.